Most electrical sources deliver energy almost immediately upon production. Batteries are an exception; they store electrical energy and deliver power to a load on demand. Batteries are electrochemical sources and use a chemical process to generate DC electricity. Batteries supply power to the load and are then recharged to repeat the cycle. This article explains the electrochemical process and the types of batteries and their characteristics, with a focus on lead-acid batteries. In the early 1800s, Alessandro Volta experimented with chemical action between unlike metals in a salt solution used as an electrolyte. 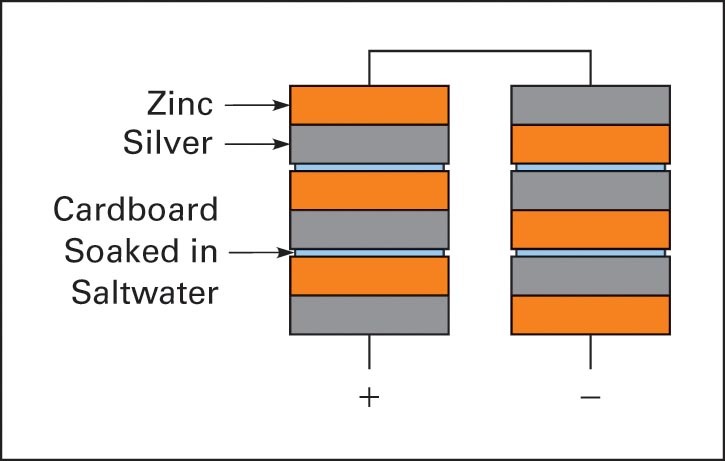 Volta designed a battery made of zinc and silver plates, separated by an insulator soaked in a salt solution. Volta stacked these plates together and called this battery a “voltaic pile” (Figure 1). A battery is a group of individual connected cells, with each cell producing a certain amount of voltage, depending on the materials that make up the cell. 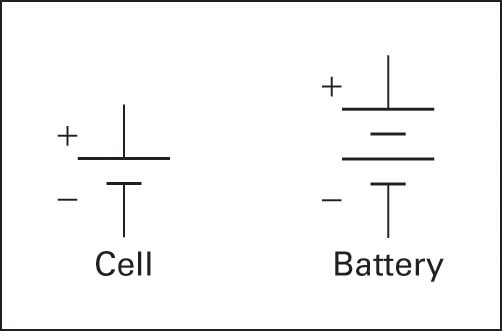 Figure 2 is the symbol for a cell and for a battery. Batteries have two voltage ratings, one at no load and one at rated load. The voltage at the rated load is in the manufacturer specification and is the voltage on the battery label. 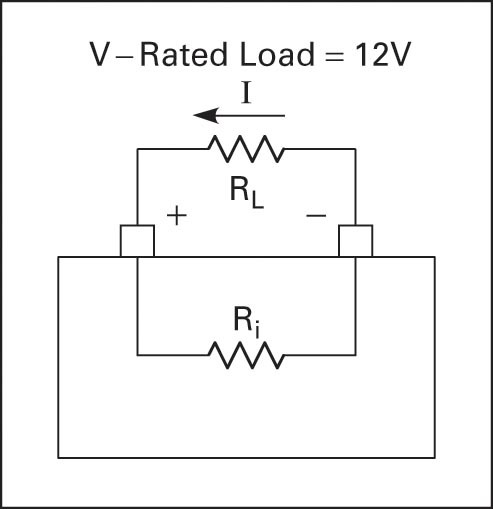 The no-load voltage is greater than the rated-load voltage because of the internal resistance of the cell. 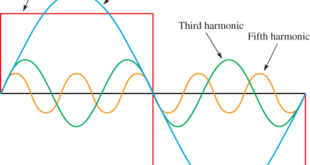 All cells have some internal resistance, and when there is a load drawing current, some of the voltage is dropped across the internal resistance. To obtain an accurate voltage reading, the battery must be loaded. Figures 3 and 4 illustrate the output voltage at no load and full load due to internal resistance. If a battery has a terminal voltage of 13.5V at no load and the voltage measured at full load is 12V, then 1.5V have been dropped across the internal resistance (13.5V − 12V). 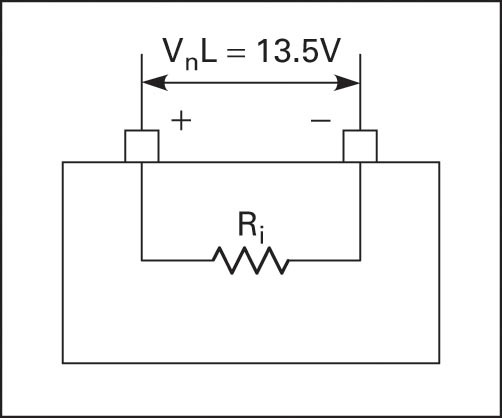 If the load is drawing 10A, then the internal resistance is 1.5V/10A = 0.15Ω. A single lead-acid cell consists of one plate of pure lead, Pb; a second plate of lead dioxide, PbO2; and an electrolyte of dilute sulfuric acid, H2SO4. The plates are surrounded by the electrolyte. The electrolyte solution has a specific gravity of 1.215 to 1.280 when the cell is completely charged, depending on temperature and application. Specific gravity is a measure of the amount of acid contained in the water. Water has a specific gravity of 1.000, and the acid increases the specific gravity. 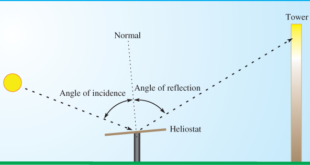 A device used for measuring the specific gravity of a cell is called a hydrometer. With practice, specific gravity readings can be used to give a good measurement for battery state of charge. When current flows from a battery to a load, the battery is discharging. Figure 5 shows a load connected to the plus and minus terminals of a battery. The positive plate consists of lead dioxide, and the negative plate is pure lead. As the battery discharges, the negative and positive plates are coated with lead sulfate, and water is produced, diluting the electrolyte. A discharged lead-acid cell has a specific gravity of 1.000. During discharge, a 12V lead-acid battery falls to about 10.8V and can be restored to its original state by charging. A DC source is connected to a battery for charging, as shown in Figure 6. The charging source must have a voltage higher than the battery voltage to push current into the battery. A 12V battery is charged with about 14V. Charging current reverses the chemical action of discharging, and the electrolyte returns to a specific gravity of approximately 1.215–1.280. 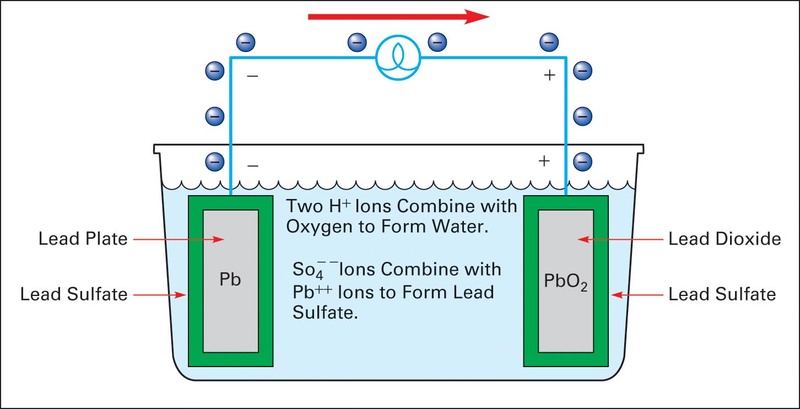 During charging, lead sulfate is removed from the plates and dissolved by the electrolyte. 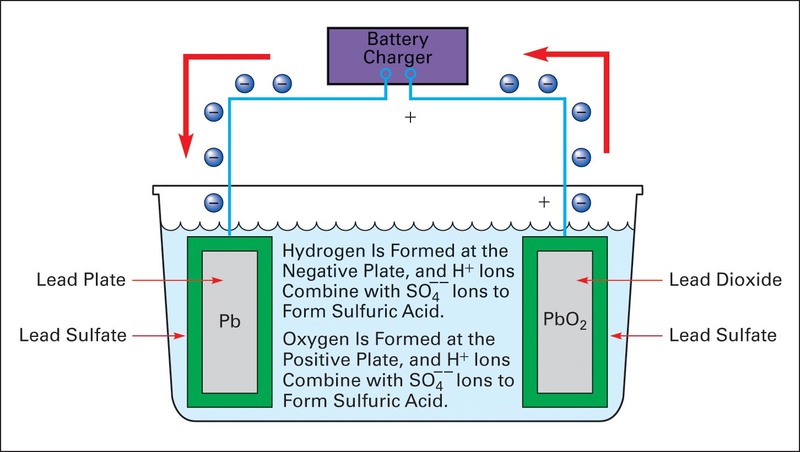 If charging current is too high, then lead sulfate is removed faster than it can be dissolved and drops to the bottom, where it causes the plates to corrode and short circuit. Proper charging returns the plates to pure lead and lead dioxide. A charge controller is used to regulate battery discharging and charging. A rechargeable battery is a group of secondary cells connected together (Figure 7). The plates are separated by dividers, and the battery is packaged in a non-conductive case. • Separators keep positive and negative plates separated. • The cell divider keeps groups of cells separated. • Electrodes provide 1 and 2 connections to the load. • The case protects the plates and holds the electrolyte. Sulfation is a crystallization of lead sulfate on the plates of lead-acid cells. As a battery charges and discharges, lead sulfate will slowly change to a hard crystalline form that does not dissolve on charging, blocking the plates from returning to lead and lead dioxide. Over time, the plates become less active, and the ability to charge declines. Leaving a battery in a discharged or partially discharged state accelerates sulfation. Sulfation can be partially reversed by applying a sequence of short bursts of high current for a period of time. 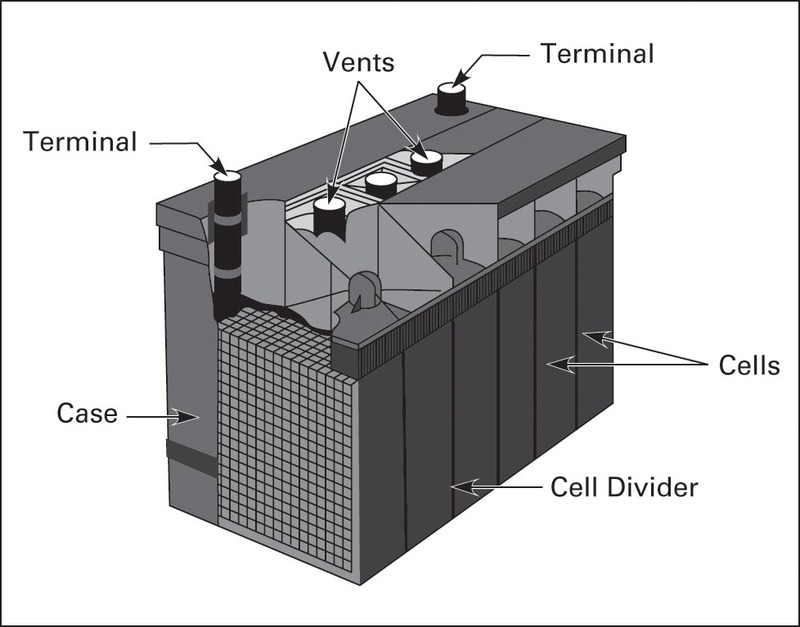 Stratification occurs in a lead-acid battery with a liquid electrolyte. If the battery isn’t cycled for long periods, the electrolyte separates, with the water rising to the top and acid dropping to the bottom of the case. This increases corrosion at the bottom of the cells and decreases output. Stratification is minimized by frequent discharging and charging cycles, which keep the acid and water mixed. State of charge (SOC) is the percentage of battery voltage remaining compared to the fully charged state. Voltage is affected by the charge remaining, the rate of discharge, and temperature. 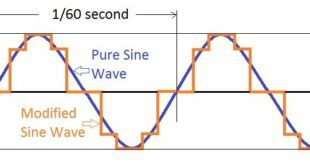 As current flows to a load, the voltage varies because of internal resistance. The higher the discharging current is, the greater the voltage drop is across the internal resistance and the faster energy (ampere-hours, or Ah) is used; thus, the higher current removes less energy (Ah) before the battery reaches its cutoff voltage (less power goes to the external load). A lower discharge rate removes more energy (Ah) before the battery reaches its cutoff voltage (more power goes to the external load). 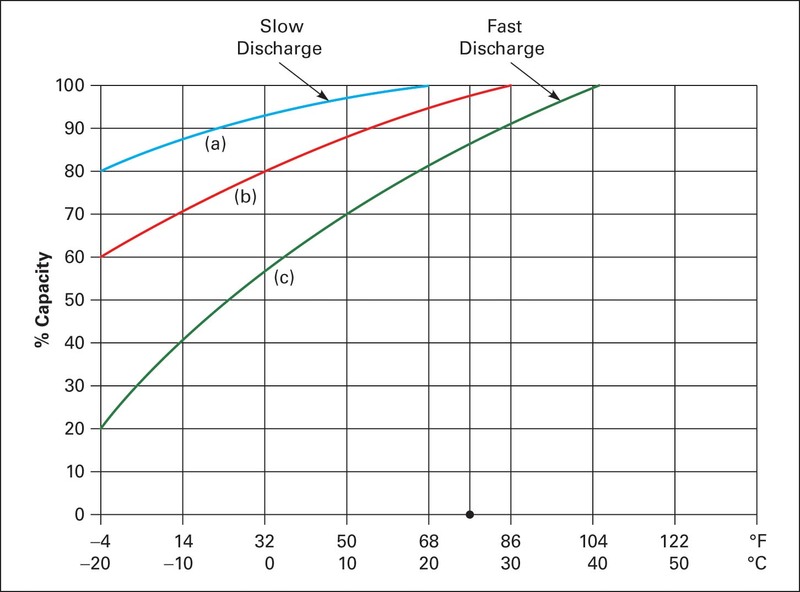 Figure 8 shows how voltage decreases compared to energy removal (Ah) at different discharge rates. 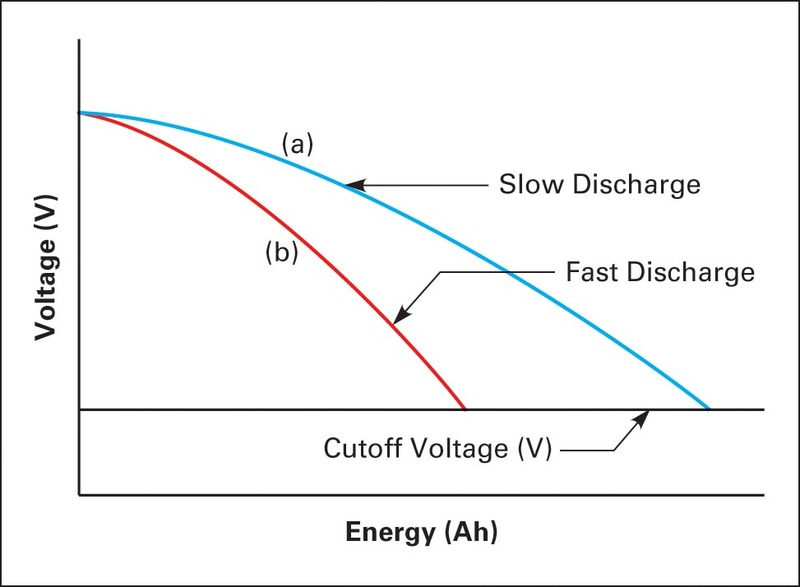 At a slow discharge rate, current (amps) is supplied to the load at a higher voltage for a longer period of time before dropping to the cutoff voltage. At a higher discharge rate, cutoff occurs sooner. Cutoff voltage is the minimum discharged voltage recommended by the manufacturer. The discharge rate is the ratio of amperes to rated capacity. For example, a battery rated at 100 Ah and discharging at 5 amps will have a ratio of 5/100 = 1/20, which is a C/20 discharge rate. This means that 1/20 of rated capacity (1/20 * 100Ah) is discharged at 5A per hour and the battery is discharged in 20 hours. A C/10 discharge rate is 10/100 = 1/10. This means that 1/10 of rated capacity (1/10 * 100Ah) is discharged at 10A per hour and the battery is discharged in 10 hours. In Figure 8, curve (a) could represent a C/5 discharge rate, and curve (b) could represent a C/20 discharge rate. Under ideal conditions, a battery rated 180Ah at 9A could supply 9A continuously for 20 hours (180/20). The capacity of a battery is rated in ampere-hours (Ah) or watt-hours (Wh). A battery that delivers 10 amps for 20 hours has delivered 200 Ah (10A 3 20h), and if the average voltage is 12V during discharge, then it has delivered 2400 Wh (12V 3 200Ah). The capacity of a battery isn’t a fixed quantity but varies according to temperature and discharge rate. The lead-acid chemical reaction is temperature sensitive. As battery temperature increases, the internal resistance decreases, there is less voltage drop across the internal resistance and capacity increases. Battery capacity (amps it will hold) decreases as temperature goes down and increases as temperature goes up. Warmer batteries will hold more charge than colder batteries. Although capacity is higher at warmer temperatures, the battery discharge-charge life cycle is shortened. Figure 9 illustrates capacity as a function of temperature and discharge rate. On curve (c) at 25°C, a battery has 85% capacity, and at −20°C, it has only 20% capacity. On curve (a) at 25°C, it has 100% capacity, and at −20°C, it has 80% capacity. Temperature also affects charging voltage: at −40°F, a 12V lead-acid battery is charged at about 15.6V, and at 77°F, the charge voltage drops to about 13.3V. The standard rating for batteries is 77°F (25°C). Autonomy is the amount of time a fully charged battery can supply the system load without recharging and is expressed in days. For example, in a photovoltaic (PV) system, autonomy is specified based on the average “no sun days” over a period of time. In the southern United States, it may be sized as an average of two continuous days without sun, and in the north, it could be three to four continuous days without sun. Therefore, battery capacity and autonomy are sized to those criteria. Autonomy can also be a function of the application. If the load can be controlled or if an engine generator is available for charging, then the days of autonomy are adjusted. In some applications, the allowable battery depth of discharge can be increased producing longer autonomy. For example, battery depth of discharge may be rated at 25% in the summer and 50% in the winter, therefore, the time between charging is increased in the winter. When designing a battery backup system for PV or wind systems, both autonomy and depth of discharge (DOD) should be considered. DOD is the percentage of battery energy used compared to the fully charged capacity. A battery has a specification indicating the allowable DOD. Deep-cycle batteries will often allow 80% discharge, while an automobile battery may be rated at 20% DOD. The allowable DOD is based on battery type, temperature, and other factors. Allowable DOD can have a significant effect on autonomy when sizing a backup system (see the discussion of battery bank sizing later in the chapter). There are numerous charging methods used to ensure that batteries are charged to capacity. Charging rate is indicated the same way as for discharge rate. A charge rate of C/20 supplies 10A of current to a 200Ah battery until charged. Normal charging means using a high charge rate and bringing batteries to 80% to 90% of full charge rather quickly. After a battery is brought to 80% to 90% of full charge using normal charging, the charge current is then reduced, and the battery is slowly brought to full charge. This method is referred to as absorption charging. When the battery reaches 100% charge, then a trickle or float charge is used to maintain the charge level at close to 100%. A battery will lose some charge over a long period of time even though it isn’t feeding a load. The level of float charge is selected to maintain full charge. Most charge controllers implement all three of these charge sequences. Cells in the same battery often take a charge at different rates, and they also discharge at different rates. Therefore, batteries that have flooded (liquid) electrolyte and are vented should have an equalization charge applied. The applied voltage is above normal charge values and at a value to cause gassing. An equalization charge is often applied when capacity has deteriorated; sulfation and stratification can be minimized with periodic equalization. Review the battery specification for the recommended frequency of equalization. Sealed batteries don’t require equalization and can be damaged with equalization. The most common batteries used in renewable energy applications are lead-acid types and are classified as (1) traction, (2) starting, and (3) stationary. • Traction batteries are deep-cycle batteries designed with thick plates. This design delivers less peak current, allowing DOD to 80%. Deep-cycle batteries are regularly discharged and charged many times. Traction batteries are used for PV and wind turbine applications. • Starting batteries are not designed for deep-cycle discharge. They have a large number of thin plates designed to supply maximum current for short lengths of time but are not recommended for repeated discharge and recharge. Starting batteries are mostly used for starting automotive engines. • Stationary batteries are designed for applications such as uninterruptible power supplies (UPS). UPS batteries supply selected critical loads such as computers, specialized health appliances, and emergency lighting. These batteries are not designed for frequent discharge and charge cycles. These are sealed lead-acid batteries. The electrolyte is not in liquid form, as in the more common flooded-electrolyte batteries. Two common captive designs are gelled cell and absorbed glass mat. Gelled cell batteries have silica added to the electrolyte as a heated liquid, and after cooling, the electrolyte is in the form of a thick, jellylike mass. Absorbed glass mat (AGM) batteries have the electrolyte suspended in fiber-glass mats that are then mounted between and in contact with the plates. Captive batteries are charged at lower current and slower rates than vented batteries to better control gas buildup in the case. Accurate regulation to prevent overcharge and over-discharge is needed, or battery life is shortened. 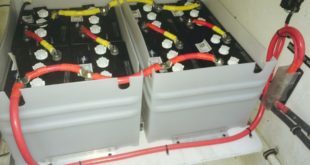 The primary advantages of captive electrolyte batteries are that they will not spill, are easy to transport, and require very little maintenance. Nickel-cadmium (NiCad) batteries are rechargeable. They are constructed with a positive plate of nickel hydroxide and graphite to increase conductivity. The negative plate is made from cadmium oxide; potassium hydroxide is used as an electrolyte. These batteries are rechargeable, and on average, they can be recharged more than 2000 times. 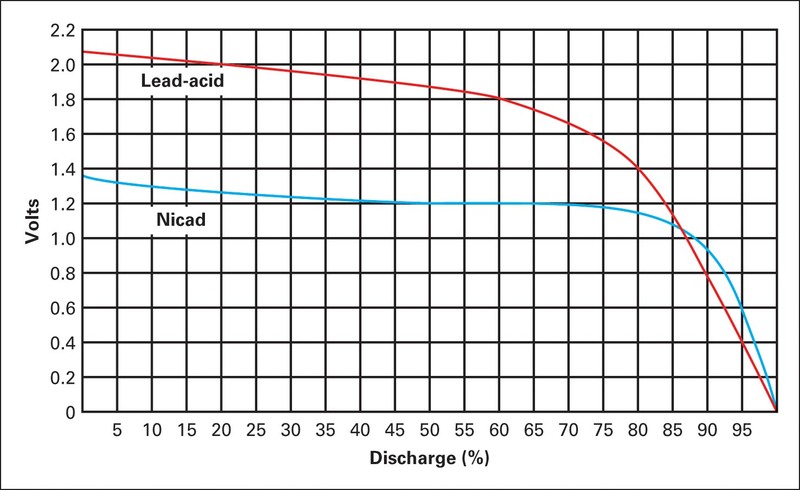 The discharge voltage drop in NiCad batteries is less than that of lead-acid batteries, as illustrated in Figure 10. A NiCad cell develops 1.2V, and a lead-acid cell develops about 2.2V; therefore, 10 NiCad cells are required, as opposed to only 6 lead-acid cells, for 12V. If nickel-cadmium batteries are only partially discharged and then charged and this cycle is repeated many times, then the battery develops “memory” for this cycle and it becomes the batteries normal characteristic, reducing capacity.